Hair: Brown originally, grey after exposure to radiation. Story: Phil Seleski grew up reading the comic book Dr. Solar. It inspired him to become a nuclear physicist himself . One day in september 1990, there was an accident at the Edgewater Nuclear plant where Phil worked. Radiation was leaking and the plant threatened to blow up. Seleski entered the plant and went to the reactor to switch it off. He succeede in switching of the reactor but fell into the reactor doing so. He was found badly burned by a rescue team and taken to a hosital [2-4]. At the hospital Seleski didn't die as expected but healed instantly. He discovered that he had the ability to control energy of any kind and had become a god. At the same time he began dating his co-worker Gayle Nordheim. Seleski realized that the nuclear power plands around the world weren't safe and started to dismantle them one by one. This made him an enemy of the state and the US government stated to make plans to kill Seleski. Along with Erica Pierce and Doctor Dobson at Edgewater they made a weapon which could destroy Seleski. After the first attack which almost killed Seleski, he went into space and absorbed the energy of a sun in an uninhabited solar system and went back to Earth. The plan was to be powerful enough to do what he wanted to do and to be with Gayle. Unfortunately he had absorbed too much energy and could not contain it. Instead he destroyed the Earth [5-11]. The destruction of Earth moved Phil back in time when the accident hadn't happened yet. When he realized this, he tried to prevent the accident from happening on this Earth too. While working on preventing the accident, guilt and frustration made him split up in two parts: Phil Seleski and Doctor Solar. Doctor Solar tried to be the hero from Phil Seleski's comics and tried to find out what was happening to him. This led him to the Harbinger Foundation and a fight with Toyo Harada. 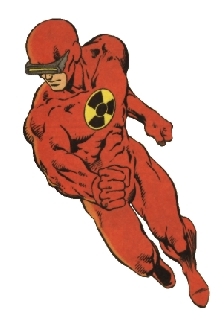 Phil Seleski continued trying to prevent the accident at the nuclear plant from happening again and at the same time to merge with Doctor Solar. The accident at the power plant happened again and the Phil Seleski of this Earth tried to save everybody. He was saved by the other Seleski who had tricked Doctor Solar into going to the plant and merge with him. The Phil Seleski of this Earth had taken in too much radiation to survive while trying to save the plant. He merged with the other Phil Seleski, leaving one Phil Seleski [2-5]. A year after the accident, Phil Seleski had settled in and was working as a scientist when he discovered the spider aliens. The spider aliens were feeding of the population of Earth, literally, and had infiltrated the Earth. Seleski started out by destroying some of the forces on Earth and went into space where he found a lot of space ships with spider aliens and human prisoners. When he had destroyed the spider aliens he could find in space, he chased them for about a year before returning to Earth [6-9]. When he returned he went back to his job at Edgewater Nuclear plant until it was closed in 1992. At the same time he began dating his co-worker Gayle Nordheim. Their relationship developed into them moving in together . They moved to California where they both got jobs at Lawrence Berkeley Labs . During an attack from Master Darque who tried to make Seleski go insane, Seleski split up in two again. This time it was the warrior aspect of him who got a physical form. The Destroyer aspect of Seleski solved the problem of wanting to eradicate the spider aliens by going into space after them while Seleski stayed behind . The Destroyer eventually found and destroyed the spider alien's home planet  and returned to Earth in the year 4020. The power made Seleski feel less and less human as time went by. He therefore invented another identity, Phil Miller, for a time while trying to recapture his humanity [16-17]. The experiment was a disaster ending in Phil going billions of years back in time where he created another world where he could contol things. This experiment was also a disaster and he returned to Earth [18-22]. When Seleski returned to his own Earth, six months had gone by . He started drifting around to relearn how to be a human, but instead ended up being chased by the US government. An attempt to catch Seleski ended in a big explosion, killing millions of people, after which he left Earth. Right before he left Earth, he repaired the damage from the expolsion. In space he merged with a dying sun saving its planets [24-32]. Seleski apparently returned to Earth. It has been revealed that he returned Aric to the year 410 A.D. and accidently created an alternate reality . In this world, there was no Phil Seleski, but instead the Seleski twins, Frank and Helena. In the future of this reality he was also known as Mota. From his original timeline, Seleski knew that apocalypse was about to happen and wanted to destroy the world. The Seleski twins talked him out of it and Seleski gave his powers to them, so they could save the universe . Unfortunately the Seleski twins couldn't handle the power and went mad, and Seleski ended up having to stop the twins by killing Frank . Seleski was last seen trying to stop the armageddon started by Alex Darque from the Seleski twins' reality. At this point in time Seleski was apparently back with Gayle in their original reality [35-37]. Skills & abilities: Solar can manipulate energy at the atomic level. This allows him to change the physical properties of materials, to fly and to move in space and time.